“We’re just in the community, and we’re just trying to make good use of the gifts that God has given us. We share them however we can,” Deb says. But their dedication to promoting their community and their home state has shone through for the better part of two decades, prompting the Holton/Jackson County Chamber of Commerce to name the Browns to this year’s group of Hall of Fame inductees. It’s a humbling honor, they said, but one they’re proud to accept. It’s not something they saw coming when they purchased a small farmhouse east of Soldier in 1996 — the house that served as the seed from which Red Rock Guest Ranch grew. 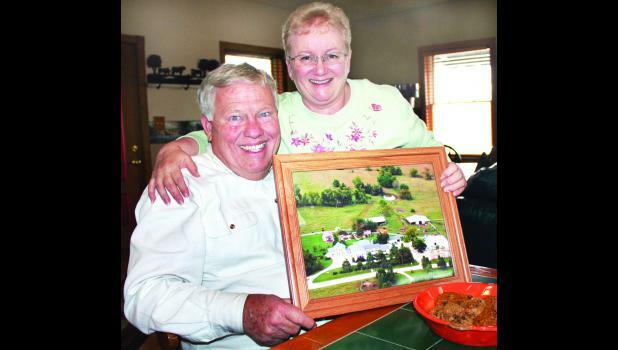 Deb’s sister and husband, Terry and Bob Bernatis, purchased 80 acres with a new house east of Soldier, and the Browns made the decision to buy the adjacent 80 acres with the older farmhouse, even though their insurance agent — fellow Hall of Famer Rich Mulroy — told them he didn’t believe the house would amount to much. The Browns moved out to the house “full-time” in 1998, after they had retired from professions they’d held for three decades — for Bill, the U.S. Army, and for Deb, a position at Security Benefit in Topeka. The next year, they started building onto the house, with Deb noting a greater reason for the additions. Red Rock Guest Ranch opened to the public in 2000, offering three bedrooms and three bathrooms for its guests. It wasn’t long before the Browns got their first customer, a woman from California whose mother, a Soldier resident, had recently died, and she needed a place to stay while settling her family’s estate. “That was the need we were trying to address,” Deb said. Today, Red Rock Guest Ranch has lodging for up to 40 people, the Browns noted. The guest house has five bedrooms and four baths, and there are six more rooms in the main house. And then, there’s the hunting lodge, a renovated barn sitting east of the main house, with room for another 16 — mainly hunters passing through the area during deer and turkey season. In the early years of the Guest Ranch, the barn was where the Browns would host their immensely popular “chuckwagon shows,” featuring music and culture of the “Old West” in addition to good-natured family humor and Francis Turley’s chuckwagon cooking. The shows ran until 2007, the year that the area was hit with a massive ice storm that left the Guest Ranch without power for two weeks and caused a lot of infrastructure problems. The next spring, the Soldier area was hit by a deadly tornado that didn’t cause a lot of damage to the Guest Ranch but still dampened the spirits of the area for a while. On top of that, Bill was having health problems, and the triple whammy spelled the end of the chuckwagon shows. But it didn’t stop them from continuing to run the Guest Ranch, opting to wait until Bill recuperated to “do something different” with the barn, and in 2009, the barn was converted into a hunting lodge. And there’s still plenty of room in the hall for wedding receptions, business meetings and other sizable events. It’s just one attraction of the Guest Ranch that draws people in, along with the rose garden that Deb maintains and is still used as a backdrop for country weddings with “hay bale” seating. The Guest Ranch also served as a working ranch where Bill took care of about 100 head of registered Limousin breeding stock cattle. However, the Browns recently sold the cattle operation, citing their age and the need to slow down. But they’re not ready to give up the Guest Ranch as a destination for hunters and others from across the country. Deb said that hunters from as far away as Texas, Michigan and Louisiana — and from all stripes of day-to-day occupation — have bunked down at the Guest Ranch on hunting trips, and many of them have come back to visit with their families at other times of the year. Not only does that mean good business for the Guest Ranch, but for Deb, it helps her with one of her key causes — Kansas agritourism. The Guest Ranch also provides the Browns with plentiful opportunity to serve their community, giving young people summer jobs and taking some of the responsibility of raising cattle off their shoulders. What’s more important, they said, is that for many young people, the experiences they have at the Guest Ranch help them to get different jobs later in life and encourage them to grow as people. Deb cited one instance in which a single mother called Bill “out of the blue” and asked if he would give her son a job. He did, and it instilled a sense of accomplishment in the young man, who turned out to be “a fine young man,” she said. They’re also involved in the Soldier community, with Bill getting involved in the recently-developed Community Core group. That group, they said, enabled the creation of a “bookmobile” that offered young people reading opportunities over the summer, as well as healthy snacking options. They’ve also opened up the Guest Ranch to schools in the area, allowing young people a visit to a working cattle ranch and the opportunity to experience the world of agriculture. And they do what they can to share their philosophy of getting more involved in the community with the next generation. And as long as they can continue to do it, they will.